Bonnie Hunter is coming to town! I was contacted a year or so ago by Jo, of Jo's Country Junction, asking if I would be interested in giving my presentation/trunk show during their Bonnie Hunter retreat. Well...SURE! Bonnie and I have e-mailed back and forth, but we have never met in person. Initially I was just giving my presentation and going home, but then I thought it would be fun to stay for the whole thing and take the classes from Bonnie and Jo & Kelli. I was lucky that they had room for me. And....my friend Nancy, from California, is coming too! And even more exciting? You can come too! Not for the whole retreat, but you can come for our presentations. There is a small vendor area that opens for shopping at 5:00 - I will be set up and have lots of good stuff - then I present at 7:00 and Bonnie is up after that. This is all taking place at the middle school in Oelwein, IA - here is a link to Jo's blog for more information. Hope to see you there! It's 72" square. I was planning to add a bow tie border to it, but it was going to make it way too big. So, now I'm working on bow tie quilt #2! Well, I'm not actively working on it, but maybe someday! You can see this in person at the trunk show - I packed it yesterday! If you aren't familiar with Bonnie, you really are missing out - here is a link to her website - she posts on her blog daily, and offers a ton of free patterns, and her books are all really great. Now back to the KC quilt show - I was so busy showing you the quilts in my last post that I forgot to show you my purchases. 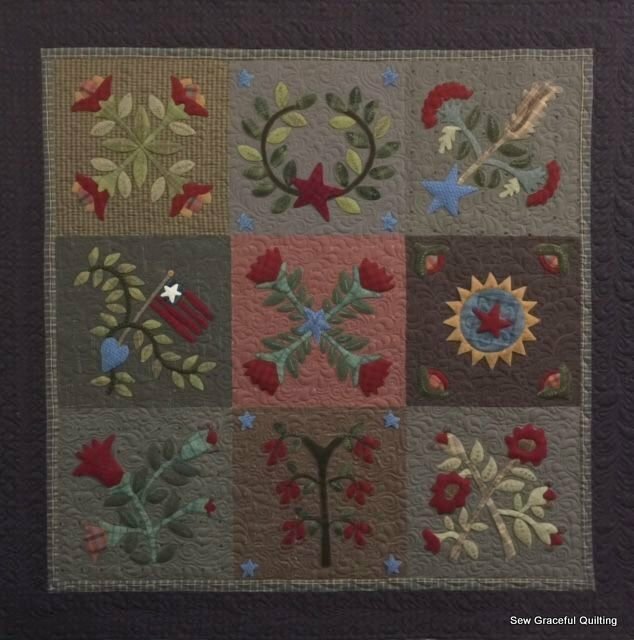 I usually don't have much time to shop, but Sew Graceful Quilting is offering a new block of the month that I wanted to see in person, so I made a bee-line to their booth early one morning before the show opened. I signed up for the BOM (you know, because I didn't already have enough to do!). It is called Simply Vintage, and is designed by Cherie Ralston and Alma Adams from Blackbird Designs. The book is out of print, but Sew Graceful has them. Here is the first block - this isn't stitched, but I did finish stitching it last night, but didn't take a pic. Then I had another weak moment and bought this! (Also in the Sew Graceful booth!). And just so you know that I do finish things now and then...here is my finished Merry Christmas, designed by Buttermilk Basin. My friend Kym Ward of Reds Threads machine quilted it for me - she does amazing work - message me if you want her info - she would be happy to quilt for you too! 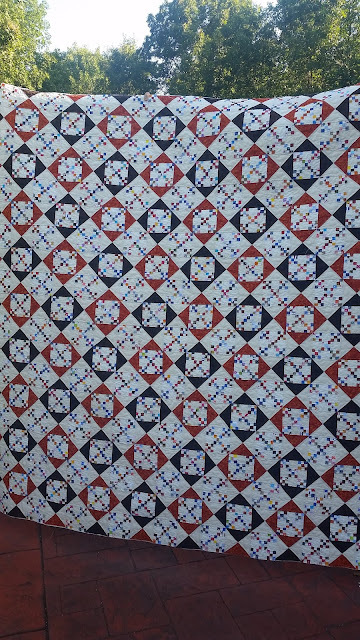 I made this quilt as a BOM, also through Sew Graceful - they do a great job choosing wool and fabrics. I think they are running this again, so you can sign up for it too! Oh my...I rarely edit my pictures, because it just takes too much time and then I won't get anything posted. But, I see that I should have edited out that ugly foot! My toes were really meant to be someone's fingers - they are long and skinny - and it's all my dad's fault - they look just like his! Lol! Ok, now get your friends together and make plans to head to Oelwein, IA on Friday night! Fun at the Kansas City Regional Quilt Fest! I promised to post these pictures from the KCRQF. As always, I was bad about getting the information on the maker. I'm hoping that you can click on each one and see it. There were a ton of really beautiful quilts there, and these are just a few that caught my eye. First a couple pics of my booth. We don't ship the yardstick stars because they are too big and cost more to ship than the price of the star. I didn't take these until the third and final day of the show - yu can see that we are about sold out of ruler boxes. We started with huge stacks and also had extras in both baskets of the cart and stuck behind all of the jewelry stands. And look at this! A customer who purchased the pattern at the show in Springfield, IL sent me this picture a few days ago - her version of Gathering Favorites! LOVE IT!!!! Thank you, Bridget, for sending it! And on to the quilts! Since my niece is such a chicken lover, I always have to be sure to take pictures of any chicken quilts. This is a Bonnie Hunter design - I also take pictures of all BH quilts and send them to her. I love this Dear Jane quilt made in all neutrals, but I could never make it. I need color! But, isn't it amazing? Since my hubby is a beekeeper, I'm always drawn to anything with bees. Another Bonnie quilt - I will be making this one next week - more on that soon! And that's all for now. I can't pick a favorite - I think they are all spectacular! I have a presentation and trunk show next week - gotta go get those quilts packed up! Some day I will get caught up on posting - but until then...this post will be a mish mash of everything! These patriotic pendants are from my Surprise program. This was the last installment of Surprise 2. We will be starting up a new one soon! If you read my blog regularly, maybe you remember little Grubby kitty. My husband found him in the yard last fall, and he was not in good shape at all. He had very little fur, and was really just a big mess. He went through some weird stages - for awhile he was just stinky and dirty - wasn't cleaning himself (that was a lovely stage!). And he had the weirdest little legs - they were really short, and bent funny, so he looked severely bow legged. Well, now he is clean and cute, and his legs seem to have grown and look normal now. He is really cute, and super sweet. He purrs all the time and loves to be petted. Here he is just hanging out. Oh...and his name is still Grubby, even though he's clean and adorable now! Our strawberries were so good this year, I just wish they would last longer. My nieces were here one day and we went out to the strawberry patch and picked a few, and they ate a few. They were shocked at how amazing a fresh-picked strawberry tastes. Evidently they have only had the ones from the store that really don't have any flavor! Hubby likes strawberry pie, so I made this for him. And I might have had some too! This is a bee-yoo-tee-ful stack of wool from Mary Flanagan. I just left it on my cutting mat for a week so I could drink in it's prettiness! New projects are in the works! While at the KCRQF, we went out for supper a few times with good friends who live in the area. As we left the restaurant one night this is what we saw in the sky. I'm going to end for now, but I took a lot of pictures of quilts at the show and will share them the next time. I have a few patterns that I'm ready to part with - I've made them all, and know that I won't use them again, so they are for sale. All of the prices listed include shipping in the U.S. The first one is Black Star. **SOLD** There is a bonus pattern that goes along with this that you can make from the leftovers. My friend, Nancy and I made these together while she was here one summer. Price is $6. Sorry...you will have to turn your head for this one! Original price was $15, sale price is $9. I bought this pattern and kit from JJ Stitches in Wisconsin. They substituted a pieced center, which is what I did with mine as well. This pattern includes the instructions for that too. Let me know if you are interested in any of these!